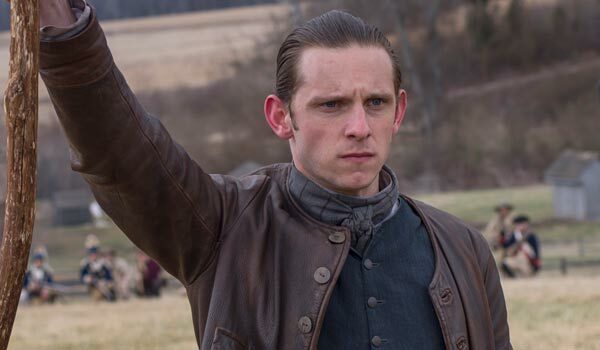 Turn: Washington’s Spies – The Complete First Season is headed onto Blu-ray next month, but there’s no better way to get patriotic around President’s day than to check out an exclusive clip from the upcoming release. You can catch outdoorsman Rogers trying to sniff out a spy in the deleted scene, below. The clip in question comes from early during Season 1. During Episode 2, Rogers (Angus Macfadyen) appears on the scene as a mercenary looking to track a man who is threatening the Long Island community with a “thicket of lies and deception.” He meets with Judge Woodhull (Kevin McNally) and his son, Abe (Jamie Bell), to discuss his plans, revealing that plots usually run deeper than one person. He also pulls out a fancy coin as the men continue to talk about deception. Deception is a thread that runs deep in AMC’s drama. The first season of the hit series focuses on Abe’s gradual introduction into Washington’s spy ring, where he learns to pass along coded messages and be of general use before he actually assumes the spy name Mr. Culper. Anchor Bay Home Entertainment is putting together the Blu-ray set for The Complete First Season, and as Turn is based on the real-life story of the Culper Ring, it’s no surprise that the set will feature a few bonus feature gems, including a look at the history of the spy ring. Deleted scenes, including the one above, will also be a part of the 10-episode set, which you can pre-order now. Despite having a niche audience, Turn will be returning for a second season, and AMC has been doing a ton of prep work to try to reel in a few more fans. First, the network renewed the show over the summer, and then re-aired the entire first season opposite Hell on Wheels to try to encourage new viewers. The show is also still available On Demand and through AMC’s site, so if you haven’t caught it yet, there’s still some time to give Turn’s first season a watch. Hopefully, all of these bids for new viewers will pay off when Turn hits the schedule for Season 2. AMC hasn’t released an official premiere date for Turn’s second season, but it is expected to hit the schedule this spring. In the meantime, Turn: Washington’s Spies – The Complete First Season will hit shelves on March 17.